This mod adds Rafts to the game. You can crafts from any 3 logs and some string, these floaty pieces of wood are a great addition to your minecraft waters. 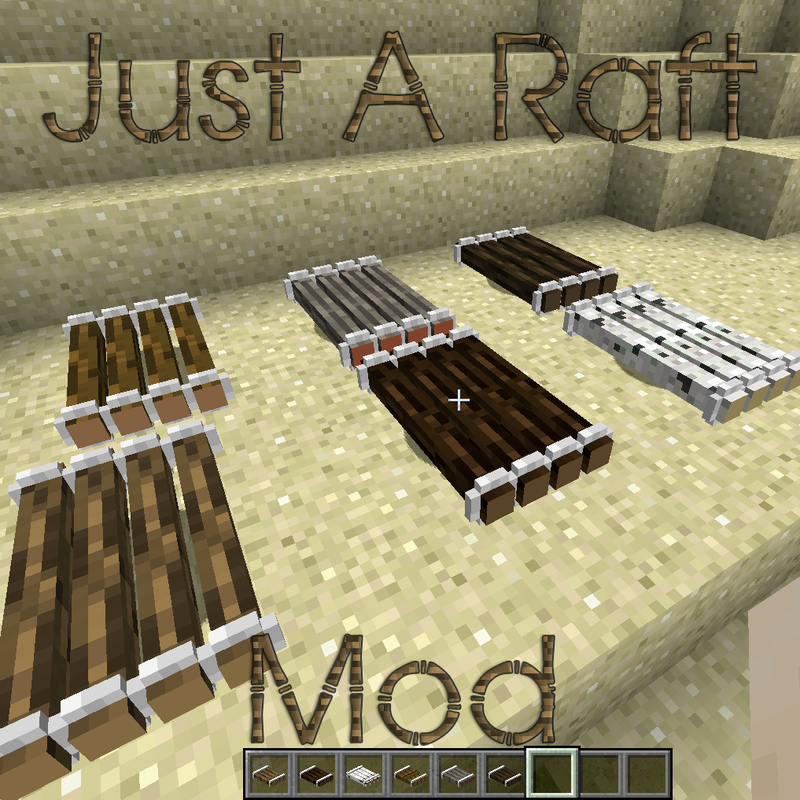 there are currently 6 types of rafts one type for each log. For questions feel free to join my Discord. I have been looking for a boat that does not break the Lily Pad. Just wanted to say thank you for updating this into 2018. Like someone else said, this would be awesome if boats weren't just as simple to make. Could we maybe have an option where these could break really easily like old boats did? Then there would be some functional difference between the two. can you make an option where if it is installed on a server and a new player joins, they spawn on a raft? This is pretty cool! Thanks for the configurable speed and multi-passenger support, that'll be super useful for modpacks. Wow. Gonna try this for sure. love it, but could you please make an 1.11.2 version? please? as a christmas pressent? you have gained a new fan, follower and friend man. Thanks! Hey, what about if a make the translations to your mods to spanish? i m from argentina, an native spanish speaker country, what do you think? let me know any time! I've backported the mod successfully to 1.11.2 so I also managed to backport that to 1.10.2. I've uploaded the version so now its just waiting for curse to approve. I like the concept, but it would make more sense if boats were more expensive and/or difficult to make early game. I am thinking about an alternate recipe for boats, but I'm not getting any good ideas. 2 wooden showels in top corners, 5 planks in middle-left, middle-right and all bottom slots, two creosote oil buckets in the remaining two slots. Awesome concept, any plans on using Oredict wood or providing a list to add wood from mods? no idea if it would be hard to use the provided textures for it or not just figured I'd show interest if nothing else.